Ashleigh Huckabey, who runs Empath Vintage. To her right is the poet Sun Queen, a spoken word artist who is also co-founder of Black Lives Matter New Haven. Lucy Gellman Photos. Ashleigh Huckabey doesn’t feel safe walking down Broadway Avenue, right where Dixwell hits the sleek, boxy stores and red and brown brick buildings that signal Yale University. But if she knew there was a community dialogue series on New Haven-Yale relations—and Yale was willing to hear her out—she might reassess. 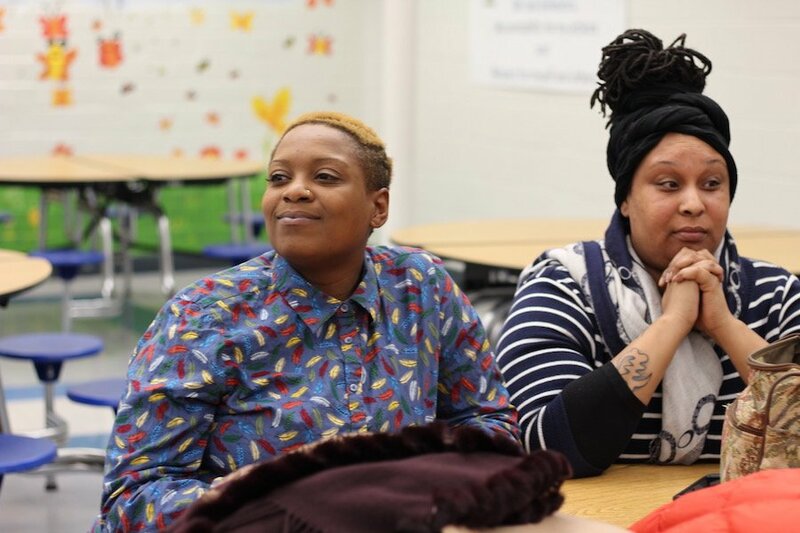 Tuesday night, Huckabey was one of over 20 New Haveners to bring ideas for the “Could Be Fund” to the Newhallville Community Management Team, held in the cafeteria at Lincoln-Bassett Elementary School off Shelton Avenue. Over 25 attended the meeting, which also addressed falling rates of neighborhood crime, and an overview of the city’s newly-passed all-civilian review board from Alder Steve Winter. Elizabeth Nearing and Caroline Smith, who are co-chairs on the Could Be Fund with Ben Berkowitz and ECIC Director Michael Harris. Announced at the end of last year, the Could Be Fund is a $152,000 project of the Elm City Innovation Collaborative (ECIC) intended to connect New Haven’s Ninth Square/Downtown, Science Park/Newhallville, and Upper State Street/East Rock/Fair Haven neighborhoods. From now through March 1, a committee for the fund is reviewing proposals for grants in two sizes: under $2,000 or between $2,000 and $25,000. Its guiding principles include connectivity, inclusivity, civic empowerment, joy, and place. All proposals must be for matching grants, meaning that the fund will cover 50 percent of the project, and hold the applicant responsible for scoring the other 50 percent. Applications have already begun coming in, from new initiatives like“Help Your Shelves” to individual light artists. 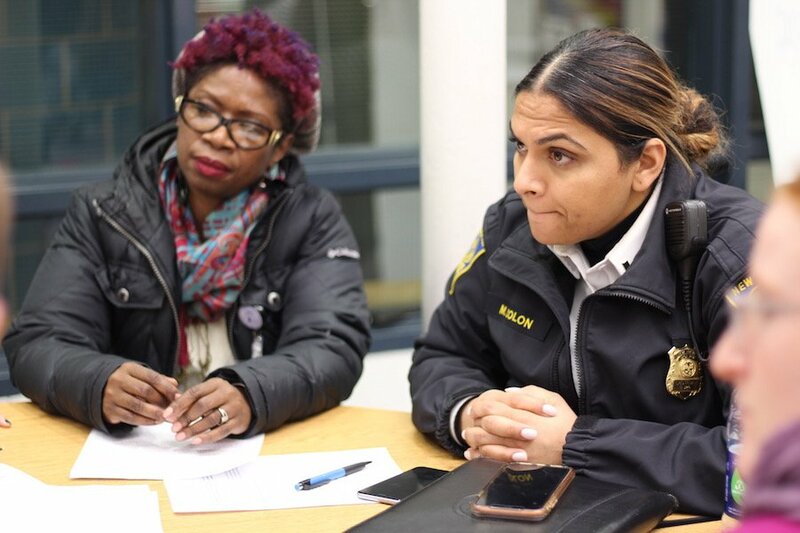 Lt. Manmeet Colon, who came to present on crime, was one of several to brainstorm throughout the evening. Now, representatives of the fund—of whom Community Management Team Chair and Inspired Communities Founder Kim Harris is one—are working to get their message into the community before the application deadline has passed. Earlier this month, member Ruby Gonzales Hernandez translated flyers for the fund into Spanish. And Tuesday, Co-Chairs Elizabeth Nearing and Caroline Smith took the floor to describe the fund and brainstorm ideas with attendees. “Like, what’s the best way to make Division Street less of a divide?” Nearing asked aloud. Before the room could debate the answer, she gave attendees an assignment: turn to someone they didn’t know or work with, and name one place in the city where they don’t feel safe. At one table, Sabrina Maher turned to her right, and started chatting with longtime Newhallvillian Alan Kendrix. While she lives in Milford, Maher is a registered nurse at Yale-New Haven Hospital, where she works several days a week. She said she feels unsafe on Sylvan Avenue, where she has witnessed altercations more than once. She’s noticed that it gets very dark and very empty, so much so that sometimes she’ll find more circuitous routes around it. 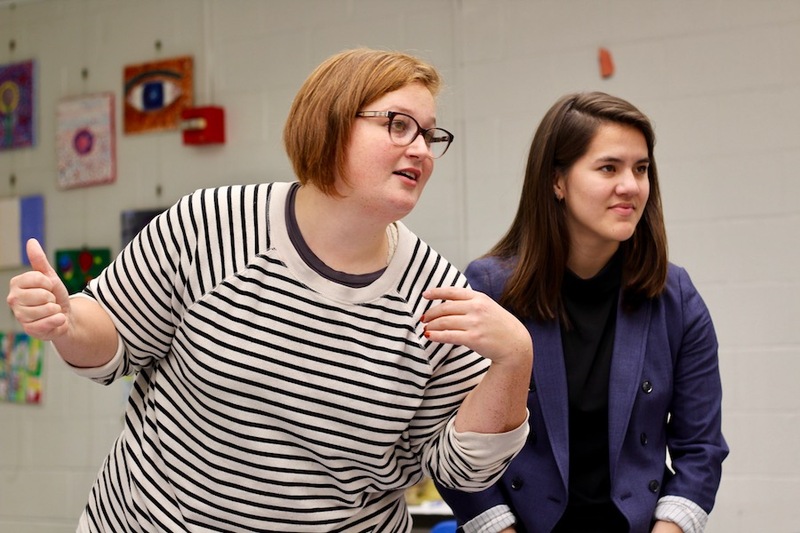 “It shouldn’t be that way, because the high school [Hill Regional Career High School] is right there,” she said. Alan Kendrix: It's all about the lighting. Kendrix, who had just announced that he is donating 10 motion-detecting lights to Newhallville homeowners to deter crime ("whether it's a two-legged rat or a four-legged rat," he said to laughs), suggested that the answer is in better lighting. At nearby tables, other suggestions bubbled up in conversation: the Farmington Canal Heritage Trail, where a number of beautification projects have already been proposed, as well as Broadway Avenue close to Yale University. “Well, when you’re homeless, it’s [feeling unsafe] kind of everywhere,” volunteered Dan Carmody from where he sat with Housing Not Jails representatives Donny and Sade. A few murmurs of agreement rippled around the room. Nearing wasn’t done with the exercise. Next, she wanted to know what would make those streets feel safer. 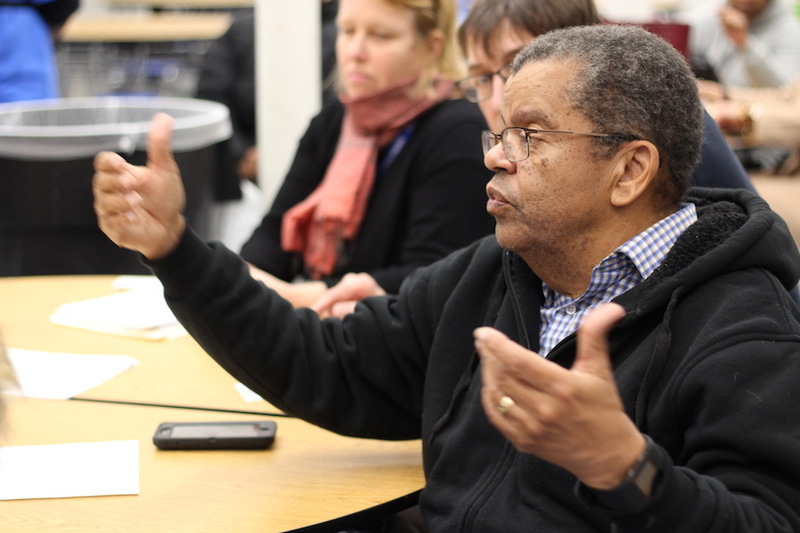 The room erupted in suggestions: lighting projects and large, bright installations, community-focused murals, mobile food pantries and full-out food trucks that take federal assistance, interactive artwork and musical performances. Dan Carmody: "When you’re homeless, it’s kind of everywhere." From a table near the front of the room, Community Management Team advisor Janette Sykes noted the sheer number of musicians she can think of who are Newhallville born and bred. One table over, Newhallville Safe Neighborhood Initiative (NSNI) member Kathy Townsend added that she’d like to see more interactive art along the Farmington Canal, which weaves through Newhallville before branching into Hamden at Goodrich Street. “We need to run together,” joked Andrea Kovacs, vice president of marketing at Albertus Magnus College. Earlier in the meeting, she had presented the college’s new “Falcon 5K Challenge,” a new running initiative that has students training for 5K runs in the city’s neighborhoods. But she wasn’t joking entirely: she said she sees the new fitness challenge as fitting into the goal of neighborhood connectivity. Further back, Huckabey and Black Lives Matter New Haven Co-Founder Sun Queen had suggestions closer to downtown. Both said that if Yale and community members were willing to partner on a dialogue series “around privilege at Yale,” they’d start feeling more comfortable in that part of the city. Right now, it remains a primarily white and moneyed space, rubbing up against two of the city’s poorest neighborhoods. Smith said she understands that applications can be intimidating—so fund co-chairs have set up a system to make the process easier. 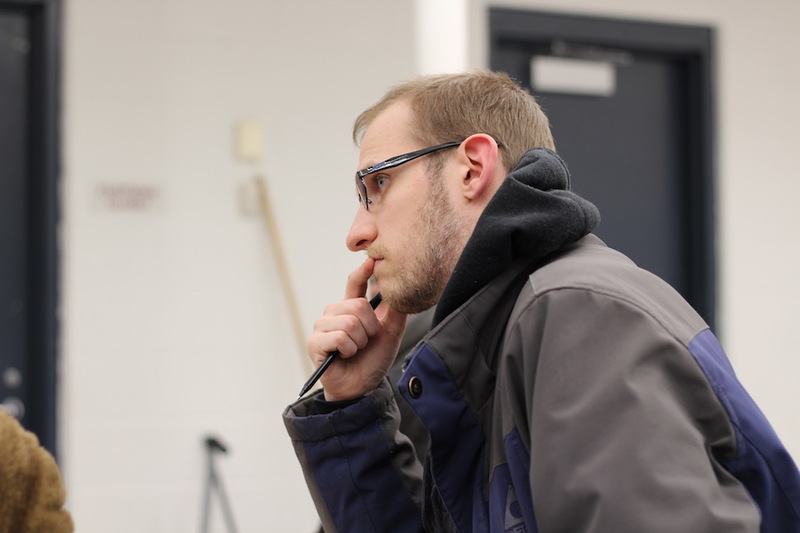 On Wednesdays and Fridays, ECIC Director Michael Harris holds office hours at Newhallville’s nearby Orchid Cafe, nestled in the Connecticut Center for Arts and Technology (ConnCAT) on Winchester Avenue. On Tuesdays and Thursdays, he’s at the New Haven Free Public Library downtown. Members and advisors on the Could Be Fund are also hosting a number of "idea/vision" office hours downtown. For more, check out the fund's resource guide.